"Keep shooting; eventually you're bound to hit something." Profile: When Misfire shoots, his fellow Decepticons run for cover. Although he insists that his aim is improving, he has yet to convince any of his comrades. And it's not for lack of trying that Misfire is so inept. His perseverance is legendary. He still holds the record for the number of times enrolled at the Decepticon Military College - 4,627 - and not graduating. The only reason he ever got out of the college was because the Autobots eventually attacked and destroyed it. But what he lacks in skill, he makes up for in enthusiasm. He is an unrelenting opponent, always overheating with excitement in anticipation of combat. He throws himself into action with all guns blazing, and doesn't stop shooting until he runs out of ammunition (which usually occurs before he hits anything worthwhile). Megatron values Misfire more for his ability to spread terror than anything else. "Because Misfire so rarely hits who he aims for," notes the Decepticon Commander, "it is all those whom he doesn't aim for who must worry." Misfire is paired with Aimless, a former construction engineer from the planet Nebulos. Aimless is a sleazy, careless con-man who habitually over-looked building defects in exchange for illegal payoffs when he still had a job on Nebulos. Realizing the dimming prospects of his career after a series of high-rise collapses, he seized upon the opportunity to ally himself with the Decepticons. He saw his partnership with Misfire as a new beginning full of promise and hope. But after being bio-engineered to have the ability to transform into Misfire's weapon, Aimless quickly showed his true colors. Unlike Misfire, Aimless doesn't even try to aim when he shoots. Like everything else in his life, he just doesn't care enough to bother. Abilities: Aimless converts to an ion particle blaster. He can pump up to 4,000 rounds of discrete clusters of high energy charged particles through his two barrels. Misfire converts to a proton-powered jet fighter. He's equipped with over-the-horizon pulse-doppler radar that allows him to spot flying craft within a 700-mile radius. His maximum speed is 1,200 mph, and his range is 1,200 miles. He can use weapon-mode Aimless in both robot and jet modes. Weaknesses: The shooting abilities of Misfire and Aimless are very poor. They can seldom hit a target before it hits them. 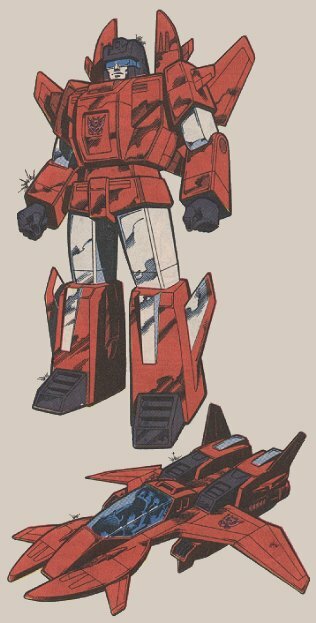 Misfire's aggressiveness and above-average maneuverability partially compensate for this deficiency.